Well, this is always a topic that gets drivers talking! How should you defrost your windscreen if you keep your car on the drive or the road, and not in a garage? As you’re getting in stocks of grit salt or de-icing salt ready for winter, you might want to think about where you’re going to store the salt, and how you’re going to spread it. Rock salt suppliers can usually also supply grit bins in various sizes, and spreaders, so it’s a matter of deciding which one will suit you. Check out this little guide to storage and distribution, and you will be able to buy with confidence. Hopefully the roads will be taken care of however clearing our driveways from ice and snow is a job we have to tackle ourselves. 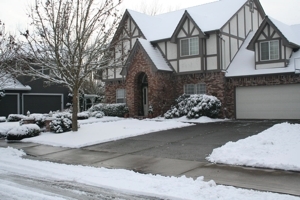 Here is our guide to keeping your drive ice and snow free. It may seem early to be thinking about winter, but the first frost will be on us before we know, and there are plenty of jobs that are much easier to do while the weather is warmer. So get ahead, and get yourself sorted out in plenty of time for winter. Check exterior water pipes are insulated from frost. Clean gutters and roof gullys out. Check engine coolent antifreeze level and top up screen wash with winter wash.
We hope this little list helps you out, like it or share it with your friends to help them out too!